2102 Oct 25: I still do not know who BREMNER was, but there are two interesting sightings of that may link to him, and one possibly of her. The 1862 China Directory lists: BREMNER, A. Turnkey, Goal. Then the 1904 Whos Who, Shanghai lists BREMNER, A.S. Bill & Bullion Broker, C/O Shanghai Club. What makes this even more interesting is the fact that in 1909, Ethel Staubb's diary of those who visited her in Hong Kong, and those she paid calls to, has multiple entries for a Miss M.E. JOHNSTONE. There may or may not be a link to Sir James John Gordon BREMER (1786-1850). He was a naval officer active in the region. A hill in Hong Kong was named after him (now known as Braemar). In 1811, he married Mrs Harriet Glasse, née Wheeler, of Waterford. SOURCE: The Irish Sea-Officers of the Royal Navy, 1793-1815 They had two sons: Edward Gordon BREMER who died age 26 in Scotland and John de Courcey BREMER (1822-1891). I have not yet been able to trace their descendants. 2006 April 20: I have recently learned that she was the governness for the Gilmore family of Liscalgot - more details will be added when I can get to it. There is a mention in The Edinburgh War Service Record of Bremner, A. A. (1921-27), Lt. (S), Hong Kong RN.V.R. This is a long shot. This biography is one of my greatest leaps of faith (based upon precious little fact), but I wanted to get these two photographs out in the world so perhaps others could shed some light on them. My curiousity is fueled by the strong reaction that various of my cousins have said when seeing this photo: "She is one of us!". But how does she fit in? It is quite likely that she is a grand-daughter (or some-such) of the Anne JACKSON who married a Richard JOHNSTON in 1767 at Creggan Church. 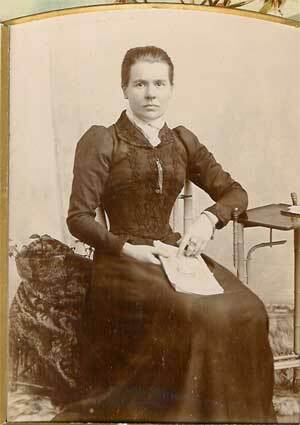 Anne was a daughter of George JACKSON & Margaret O'Laughlin. In 1828, a Richard JOHNSTON was in the townland of Tullydonnell Gage, Parish of Creggan. There was a Richard JOHNSTON who was a target of murder in 1792. He assisted in the arrests of the Murphy brothers for the Berkeley outrage in 1791. SOURCE: Ten Troubled Years: Settlement, Conflict and Rebellion in Forkhill, County Armagh 1788-1798 by Kyla Madden. April 1998. Masters Thesis. In the 1822 list of freeholders of Co. Louth it is perhaps pertinent that there is the following: Johnson John; Longfields Co. Mon. ; Roachkeane and Creggan; -; Dundalk 27/10/1806; Upper Dundalk; £50; - The connection of Monaghan and Creggan is part of what intrigues me. Freeman's Journal. 21 April 1792. 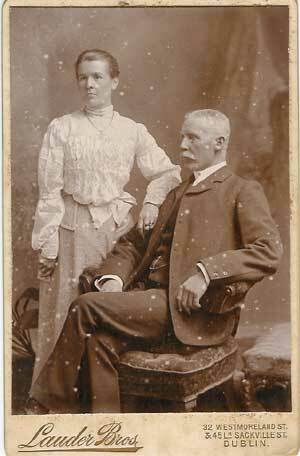 I have posted part of a Johnston Family Tree, but there is no "Mary E. JOHNSTON" showing up yet. In the Birthday book, there was also an Ena JOHNSTONE who married a STANLEY. The name BREMNER is not a common one in Ireland in the 19th century - at least from what I can see. There was a Catherine BREMNER who married a Robert HAMILTON, but that is all that I have been able to find. Sharon Oddie Brown. August 29, 2005.